Even experts need perspective. As a result, our research group collaborates with scientists pursuing answers to real-world problems. We develop individualized approaches to help researchers gain new perspectives and improve the breadth and depth of their work. Bat Flight Simulation. Back View. Eel Visualization. Bat Flight Simulation. Back View. Pathlines. Bat Flight Simulation. Back View. Streamlines. Bat Flight Simulation. Front View. Streamlines. Bat Flight Simulation. Side View. Eel Visualization. Bat Flight Simulation. Side View. Snow Visualization. Bat Flight Simulation. Side View. Streamlines. Bat Flight Tracking Overlay. Front View. Bat Flight Tracking. Back View. Bat Flight Tracking. Front View. Connor Gramazio, Jeff Huang, and David H. Laidlaw. An Analysis of Automated Visual Analysis Classification: Interactive Visualization Task Inference of Cancer Genomics Domain Experts. IEEE Transactions on Visualization and Computer Graphics, 24(8), August 2018. (pdf) (bibtex: Gramazio-2018-AAV). Cagatay Demiralp, Carlos E Scheiddegger, Gordon L Kindlmann, David H. Laidlaw, and Jeffrey Heer. Visual Embedding: A Model for Visualization. IEEE Computer Graphics and Applications, 20(1), January 2014. (bibtex: Demiralp-2014-VEM). A Ergun, G Doran, J C Costello, H H Paik, J J Collins, D Mathis, C Benoist, D A Blair, M L Dustin, S A Shinton, R R Hardy, T Shay, A Regevc, N Cohen, P Brennan, M Brenner, F Kim, T Nageswara Rao, A Wagers, T Heng, J Ericson, K Rothamel, A Ortiz-Lopez, T Kreslavsky, A Fletcher, K Elpek, A Bellemare-Pelletier, D Malhotra, S Turley, J Miller, B Brown, M Merad, E L Gautier, C Jakubzick, G J Randolph, P Monach, A J Best, J Knell, A Goldrath, V Jojic, D Koller, David H. Laidlaw, J Collins, R Gazit, D J Rossi, N Malhotra, K Sylvia, J Kang, N A Bezman, J C Sun, G Min-Oo, C C Kim, and L L Lanier. Differential splicing across immune system lineages. Proceedings of the National Academy of Sciences, 110(35):14324-14329, 2013. (bibtex: Ergun-2013-DSA). Hua Guo, Arthur Yidi, Steven R. Gomez, Mark J. Schnitzer, David Badre, and David H. Laidlaw. Toward a Visual Interface for Brain Connectivity Analysis. In CHI '13 Extended Abstracts on Human Factors in Computing Systems, pages 1761-1766, 2013. (bibtex: Guo-2013-TVI). Radu Jianu and David H. Laidlaw. What google maps can do for biomedical data dissemination: examples and a design study. BMC research notes, 6(1):1-14, 2013. (bibtex: Jianu-2013-WGM). V Jojic, T Shay, K Sylvia, O Zuk, X Sun, J Kang, A Regev, D Koller, A J Best, J Knell, A Goldrath, N Cohen, P Brennan, M Brenner, F Kim, T N Rao, A Wagers, T Heng, J Ericson, K Rothamel, A Ortiz-Lopez, D Mathis, C Benoist, N A Bezman, J C Sun, G Min-Oo, C C Kim, L L Lanier, J Miller, B Brown, M Merad, E L Gautier, C Jakubzick, G J Randolph, P Monach, D A Blair, M L Dustin, S A Shinton, R R Hardy, David H. Laidlaw, J Collins, R Gazit, D J Rossi, N Malhotra, T Kreslavsky, A Fletcher, K Elpek, A Bellemare-Pelletier, D Malhotra, and S Turley. Identification of transcriptional regulators in the mouse immune system. Nature Immunololgy, 14:633-643, 2013. (bibtex: Jojic-2013-ITR). N Malhotra, K Narayan, O H Cho, K E Sylvia, C Yin, H Melichar, M Rashighi, V Lefebvre, J E Harris, L J Berg, J Kang, E L Gautier, C Jakubzick, G J Randolph, J A Best, J Knell, A Goldrath, J Miller, B Brown, M Merad, V Jojic, D Koller, N Cohen, P Brennan, M Brenner, T Shay, A Regev, A Fletcher, K Elpek, A Bellemare-Pelletier, D Malhotra, S Turley, Radu Jianu, David H. Laidlaw, J Collins, K Sylvia, R Gazit, B Garrison, D J Rossi, F Kim, T N Rao, A Wagers, S A Shinton, R R Hardy, P Monach, N A Bezman, J C Sun, C C Kim, L L Lanier, T Heng, T Kreslavsky, M Painter, J Ericson, S Davis, D Mathis, and C Benoist. A network of high-mobility group box transcription factors programs innate interleukin-17 production. Immunity, 38:681-693, 2013. (bibtex: Malhotra-2013-NHM). M Mingueneau, T Kreslavsky, D Gray, T Heng, R Cruse, J Ericson, S Bendall, M H Spitzer, G P Nolan, K Kobayashi, H Boehmer, D Mathis, C Benoist, A J Best, J Knell, A Goldrath, V Jojic, D Koller, T Shay, A Regev, N Cohen, P Brennan, M Brenner, F Kim, T N Rao, A Wagers, K Rothamel, A Ortiz-Lopez, N A Bezman, J C Sun, G Min-Oo, C C Kim, L L Lanier, J Miller, B Brown, M Merad, E L Gautier, C Jakubzick, G J Randolph, P Monach, D A Blair, M L Dustin, S A Shinton, R R Hardy, David H. Laidlaw, J Collins, R Gazit, D J Rossi, N Malhotra, K Sylvia, J Kang, A Fletcher, K Elpek, A Bellemare-Pelletier, D Malhotra, and S Turley. The transcriptional landscape of alpha beta T cell differentiation. Nature Immunololgy, 14:619-632, 2013. (bibtex: Mingueneau-2013-TLA). J Ericson, M Painter, S Davis, C Laplace, G Hyatt, H Paik, K Rothamel, R Cruse, G Doran, T Heng, N Asinovski, Ortiz-A Lopes, A Ergun, D Gray, E Wakamatsu, J Hill, M Mingueneau, D Cipoletta, H Yoshida, C Benoist, D Mathis, N Cohen, E Kim, P Brennan, L Lynch, M Brenner, J Costello, JJ Collins, D Blair, M Dustin, J Knell, E Yang, A Best, L Shaw, A Doedens, A Goldrath, S Shinton, Y Zhou, R Hardy, V Jojic, S Mostafavi, D Koller, Radu Jianu, David H. Laidlaw, N Bezman, J Sun, Y Zhu, D Hendricks, Y Kamimura, G Min-Oo, M Morvan, T Nabekura, V Lam, C Kim, L Lanier, M Greter, J Helft, A Chow, M Bogunovic, A Mortha, J Price, D Hashimoto, J Miller, P Sathe, A Chudnovskiy, Y Lavin, J Idoyaga, M Merad, E Gautier, C Jakubzick, D' J Angelo, G Randolph, T Shay, A Regev, R Gazit, Rossi D, T Kreslawsky, Bohmer H von, A Bellemare-Pelletier, K Elpek, L Spelv, A Fletcher, D Malhotra, V Cremasco, S Turley, F Kim, TN Rao, A Wagers, and Immunological Genome Project. Identification of transcriptional regulators in the mouse immune system. Consortium biology in immunology: the perspective from the Immunological Genome Project, epub, 2012. (bibtex: Ericson-2012-NRI). D Malhotra, Anne L Fletcher, J Astarita, V Lukacs-Kornek, P Tayalia, SF Gonzalez, KG Elpek, SK Chang, K Knoblich, ME Hemler, MB Brenner, MC Carroll, DJ Mooney, SJ Turley, The Immunological Genome Project Consortium the, Y Zhou, SA Shinton, RR Hardy, NA Bezman, JC Sun, CC Kim, LL Lanier, J Miller, M Merad, AL Fletcher, A Bellemare-Pelletier, K Narayan, K Sylvia, J Kang, R Gazit, B Garrison, DJ Rossi, V Jojic, D Koller, Radu Jianu, David H. Laidlaw, J Costello, J Collins, N Cohen, P Brennan, T Shay, A Regev, F Kim, TN Rao, A Wagers, EL Gautier, C Jakubzick, GJ Randolph, P Monach, AJ Best, J Knell, A Goldrath, T Heng, T Kreslavsky, M Painter, D Mathis, and C Benoist. Transcriptional profiling of stroma from inflamed and resting lymph nodes defines immunological hallmarks. Nature Immunology, 2012. (bibtex: Malhotra-2012-TPS). Michael J. Rainbow, Joseph J. Crisco, Douglas Moore, Robin N. Kamal, David H. Laidlaw, Edward Akelman, and Scott W. Wolfe. Elongation of the Dorsal Carpal Ligaments: A Computational Study of In Vivo Carpal Kinematics. The Journal of Hand Surgery, 2012. (bibtex: Rainbow-2012-EDC). Guangxia Li, Andrew C. Bragdon, Zhigeng Pan, Mingmin Zhang, Sharon Swartz, David H. Laidlaw, Chaoyang Zhang, Hanyu Liu, and Jian Chen. VisBubbles: a workflow-driven framework for scientific data analysis of time-varying biological datasets, 2011. (pdf) (bibtex: Li-2011-VWF). Liming Xu, Jeremy Lyle, Yubao Wu, Zhigeng Pan, Mingmin Zhang, David H. Laidlaw, Robert L. Hester, and Jian Chen. HumMod explorer: a multi-scale time-varying human modeling navigator, 2011. (bibtex: Xu-2011-HEM). Ryan Boller, Scott A. Braun, Jadrian Miles, and David H. Laidlaw. Application of uncertainty visualization methods to meteorological trajectories. Earth Science Informatics, 3(1-2):119-126, June 2012. (pdf) (bibtex: Boller-2010-AUV). Eni Halilaj, Stephen Correia, David H. Laidlaw, and salloway. A Quantitative Tractography Approach for Exploring Associations between White Matter Pathways and Cognitive Functions . 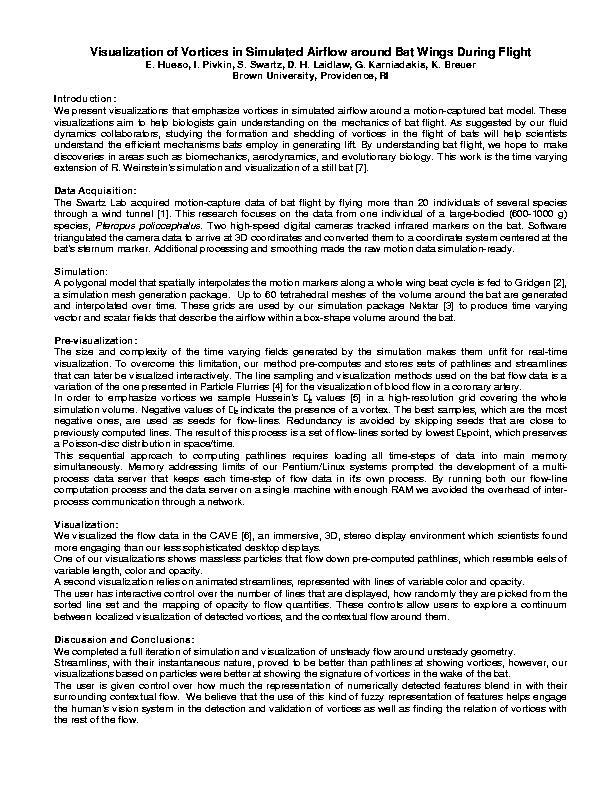 In Proceedings of ISMRM, 2010. poster (pdf) (bibtex: Halilaj-2010-MRM). Cagatay Demiralp, John F. Hughes, and David H. Laidlaw. Using Boy's Real Projective Plane Immersion for Coloring DT-MRI Slices. In Proceedings of ISMRM, 2008. (bibtex: Demiralp-2008-UBR). Mykhaylo Kostandov, Jian Chen, Igor Pivkin, Sharon Swartz, and David H. Laidlaw. Exploring Dimensionality Reduction of Animal Flight Kinematics in an Interactive Virtual Reality Setting. ACM I3D Symposium on Interactive 3D Graphics and Games, Posters Program, February 2008. (pdf) (bibtex: Kostandov-2008-EDR). Jian Chen, Andrew Forsberg, Sharon Swartz, and David H. Laidlaw. Interactive Multiple Scale Small Multiples. IEEE Visualization 2007 Poster Compendium, November 2007. (pdf) (bibtex: Chen-2007-MSM). Jian Chen, Victoria Interrante, William Ribarsky, and David H. Laidlaw. Getting Human-Centered Computing and Scientific Visualization Married: the Myth and Critical issues. IEEE Visualization Panel, Oct 2007. (pdf) (bibtex: Chen-2007-HVP). Jadrian Miles, Daniel Keefe, Daniel Acevedo, Fritz Drury, Sharon Swartz, and David H. Laidlaw. Teaching Science in Virtual Reality with a Freehand 3D Illustration. In Proceedings of IEEE InfoVis, Poster Compendium, 2007. (bibtex: Miles-2007-TSI). David J. Willis, Mykhaylo Kostandov, Daniel K. Riskin, Jaime Peraire, David H. Laidlaw, Sharon Swartz, and Kenneth S. Breuer. Modeling the Flight of a Bat. Science Magazine. 2007 Visualization Challenge Winner. Informational Graphics., 317:1860, September 2007. (bibtex: Willis-2007-MFB). A. C. Callan-Jones, Robert A. Pelcovits, Vadim Slavin, Song Zhang, David H. Laidlaw, and George B. Loriot. Simulation and Visualization of Topological Defects in Nematic Liquid Crystals. Physical Review E, 74(6), December 2006. (pdf) (bibtex: Callan-2006-SVT). Cagatay Demiralp, Song Zhang, David Tate, Stephen Correia, and David H. Laidlaw. Connectivity-aware sectional visualization of 3D DTI volumes using perceptual flat-torus coloring and edge rendering. In Proceedings of Eurographics, 2006. (pdf) (bibtex: Demiralp-2006-CSV). Mykhaylo Kostandov, Igor Pivkin, Kenneth Breuer, Sharon Swartz, and David H. Laidlaw. Proper Orthogonal Decomposition and Particle Image Velocimetry in Bat Flight. IEEE Visualization 2006 Poster Compendium, November 2006. (pdf) (bibtex: Kostandov-2006-POD). Vadim Slavin, Robert A. Pelcovitz, George Loriot, Andrew Callan-Jones, and David H. Laidlaw. Techniques for the Visualization of Topological Defect Behavior in Nematic Liquid Crystals. IEEE Transactions on Visualization and Computer Graphics (Proceedings Visualization / Information Visualization), 12(5), September-October 2006. In Press (pdf) (bibtex: Slavin-2006-TVT). David H. Laidlaw, Michael Kirby, Cullen Jackson, J. Scott Davidson, Timothy Miller, Marco DaSilva, William Warren, and Michael Tarr. Comparing 2D vector field visualization methods: A user study. In IEEE Transactions on Visualization and Computer Graphics, 11(1):59-70, January-February 2005. (pdf) (bibtex: Laidlaw-2005-CVF). David H. Laidlaw. 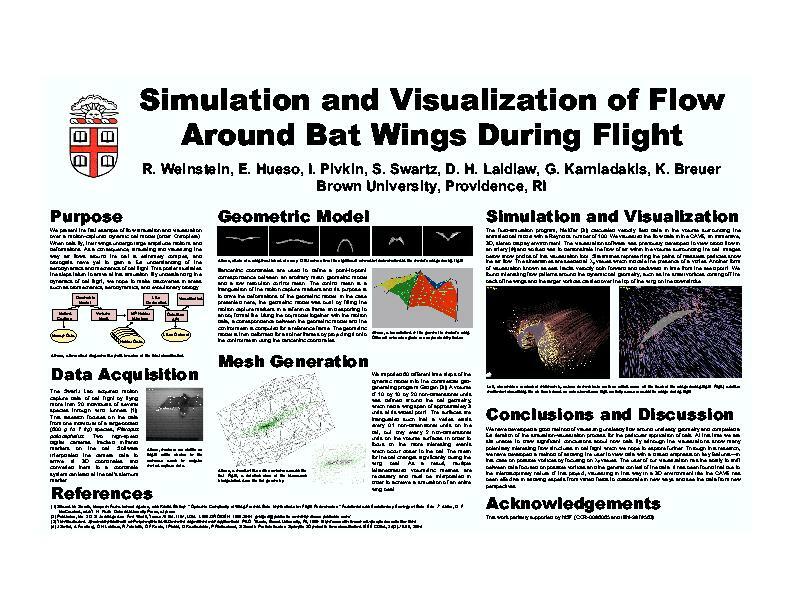 Nugget for NSF: Collaborating with Artists and Scientists to Create Scientific Visualizations of Bat Flight. Submitted to NSF Graphics/Visualization Program. Nugget ID 11396, 2005. (pdf) (bibtex: Laidlaw-2005-CAS). Igor Pivkin, Eduardo Hueso, Rachel Weinstein, David H. Laidlaw, Sharon Swartz, and George Karniadakis. Simulation and Visualization of Air Flow Around Bat Wings During Flight. In Proceedings of International Conference on Computational Science, pages 689-694, 2005. (pdf) (bibtex: Pivkin-2005-SVA). Eduardo Hueso, Igor Pivkin, Sharon Swartz, David H. Laidlaw, George Karniadakis, and Kenneth Breuer. Visualization of Vortices in Simulated Airflow around Bat Wings During Flight. IEEE Visualization 2004 Poster Compendium, October 2004. (pdf) (ppz) (zip) (bibtex: Hueso-2004-VVS). Sharon Swartz, Kristin Bishop, Igor Pivkin, George Karniadakis, David H. Laidlaw, Eileen Vote, and Daniel Keefe. 3D Kinematics of Flying Bats: Challenges of Complex Multidimensional Comparison. In Seventh International Congress on Vertebrate Morphology, Boca Raton, Florida, 2004. (bibtex: Swartz-2004-3DK). Rachel Weinstein, Eduardo Hueso, Igor Pivkin, Sharon Swartz, David H. Laidlaw, George Karniadakis, and Kenneth Breuer. Simulation and Visualization of Flow Around Bat Wings During Flight. ACM SIGGRAPH 2004 Poster Compendium, August 2004. (pdf) (bibtex: Weinstein-2004-SVF). Eduardo Hueso. Visualizing Vortices in Simulated Air Flow around Bat Wings during Flight. Technical Report CS-03-25, Master's Project, Computer Science Department, Brown University, Providence, RI, December 2003. (pdf) (bibtex: Hueso-2003-VVS). Cullen Jackson, Daniel Acevedo, David H. Laidlaw, Fritz Drury, Eileen Vote, and Daniel Keefe. Designer-critiqued Comparison of 2D Vector Visualization Methods: A Pilot Study. In SIGGRAPH 2003 Sketches and Applications. ACM SIGGRAPH, 2003. (pdf) (bibtex: Jackson-2003-DCC). David Karelitz, Daniel Keefe, and David H. Laidlaw. Using CavePainting to Create Scientific Visualizations. Technical Report CS-03-26, Master's Project, Computer Science Department, Brown University, Providence, RI, 2003. (pdf) (ppt) (bibtex: Karelitz-2003-UCT). Andrew McClain. CaveSculpture: Creating sculpture from CavePaintings. Technical Report CS-03-27, Master's Project, Computer Science Department, Brown University, Providence, RI, 2003. (pdf) (bibtex: McClain-2003-CCS). Igor Pivkin, Peter Richardson, David H. Laidlaw, and George Karniadakis. The Combined Effect of Pulsatile Inflow and Unsteady Geometry on Flow in Coronary Arteries. In Proceedings of International Symposium on Modeling of Physiological Flows, 2003. (pdf) (ps) (bibtex: Pivkin-2003-CEP). Jason Sobel. SciVL: A Descriptive Language for 2D Multivariate Scientific Visualization Synthesis. Technical Report CS-03-24, Master's Project, Computer Science Department, Brown University, Providence, RI, 2003. (pdf) (ppt) (bibtex: Sobel-2003-SVL). Eileen Vote, Daniel Acevedo, Cullen Jackson, Jason Sobel, and David H. Laidlaw. Design-by-Example: A Schema for Designing Visualizations Using Examples from Art. In SIGGRAPH 2003 Sketches and Applications. ACM SIGGRAPH, 2003. (pdf) (bibtex: Vote-2003-DBE). Stuart Andrews and David H. Laidlaw. Toward a Framework for Assembling Broken Pottery Vessels. In Proceedings of the 18th National Conference on Artificial Intelligence, pages 945-946, July/August 2002. (pdf) (bibtex: Andrews-2002-TFA). Eileen Vote, Daniel Acevedo, David H. Laidlaw, and Martha Joukowsky. Discovering Petra: Archaeological Analysis in VR. IEEE Computer Graphics and Applications, 22(5):38-50, September/October 2002. (pdf) (bibtex: Vote-2002-DPA). Daniel Acevedo, Eileen Vote, David H. Laidlaw, and Martha Joukowsky. Archaeological Data Visualization in VR: Analysis of Lamp Finds at the Great Temple of Petra, a Case Study. In Proceedings IEEE Visualization 2001 (BEST CASE-STUDY AWARD), pages 493-496, October 2001. (pdf) (bibtex: Acevedo-2001-ADV). Christopher G. Healey, Victoria Interrante, davidkremers, David H. Laidlaw, and Penny Rheingans. Nonphotorealistic Rendering in Scientific Visualization. In Course Notes of SIGGRAPH 2001, volume Course 32, August 2001. (pdf) (bibtex: Healey-2001-NRS). David H. Laidlaw. Loose, Artistic ``Textures'' for Visualization. IEEE Computer Graphics and Applications, 21(2):6-9, March/April 2001. (pdf) (bibtex: Laidlaw-2001-LAT). Theresa-Marie Rhyne, David H. Laidlaw, Christopher G. Healey, Victoria Interrante, and David Duke. Realism, Expressionism, and Abstraction: Applying Art Techniques to Visualization. In Proceedings of IEEE Visualization Conference, pages 523-526, San Diego, California, October 2001. (pdf) (bibtex: Rhyne-2001-REA). Eileen Vote. A New Methodology for Archaeological Analysis: Using Visualization and Interaction to Explore Spatial Links in Excavation Data. PhD thesis, Brown University, 2001. (pdf) (bibtex: Vote-2001-NMA). Daniel Acevedo, Eileen Vote, David H. Laidlaw, and Martha Joukowsky. ARCHAVE: A Virtual Environment for Archaeological Research. In Work in Progress Proceedings of IEEE Visualization'00, October 2000. (pdf) (bibtex: Acevedo-2000-AVE). Andrew Forsberg, Michael Kirby, David H. Laidlaw, George Karniadakis, Andries van Dam, and Jonathan L. Elion. Immersive Virtual Reality for Visualizing Flow Through an Artery. In Proceedings of IEEE Visualization 2000, pages 457-460. IEEE Computer Society Press, October 2000. (pdf) (bibtex: Forsberg-2000-IVR). David H. Laidlaw. Applying Concepts from Oil Painting and Art to Visualization. Sidebar in IEEE Computer Graphics and Applications, January 2000. (bibtex: Laidlaw-2000-ACO). Eileen Vote, Daniel Acevedo, David H. Laidlaw, and Martha Joukowsky. ARCHAVE: A Virtual Environment for Archaeological Research. In Proceedings of Computer Applications in Archaeology 2000, BAR International Series 931, pages 313-316, Oxford, England, April 2000. Archaeopress. (pdf) (bibtex: Vote-2000-AAV). Eileen Vote, Daniel Acevedo, Martha Joukowsky, and David H. Laidlaw. What's Virtual Reality Good For? The ARCHAVE System— Problems and Possibilities. In Proc. Virtual Archaeology between Scientific Research Territorial Marketing (VAST), pages 83-86, November 2000. (pdf) (bibtex: Vote-2000-VRS). Michael Kirby, H. Marmanis, and David H. Laidlaw. Visualizing Multivalued Data from 2D Incompressible Flows Using Concepts from Painting. In Proceedings of IEEE Visualization 1999, pages 333-340, 1999. (pdf) (bibtex: Kirby-1999-VMD). J. Edward Swan, Victoria Interrante, David H. Laidlaw, Theresa-Marie Rhyne, and Tamara Munzner. Visualization Needs More Visual Design! Sensory Design Issues as a Driving Problem for Visualization Research. In Proceedings of IEEE Visualization Conference, pages 485-490, San Francisco, California, 1999. (pdf) (bibtex: Swan-1999-VNM). David H. Laidlaw, davidkremers, Felice Frankel, Victoria Interrante, and Thomas F. Banchoff. Panel: Art and Visualization: Oil and Water? In Proceedings of IEEE Visualization Conference, pages 507-509, Research Triangle Park, North Carolina, October 18—23 1998. (pdf) (bibtex: Laidlaw-1998-AVO). David H. Laidlaw, davidkremers, Eric T. Ahrens, and Matthew J. Avalos. Visually Representing Multi-valued Scientific Data Using Concepts from Oil Painting. In SIGGRAPH '98 Visual Proceedings (sketch), page 249, August 1998. (pdf) (bibtex: Laidlaw-1998-VRM). Kurt W. Fleischer, David H. Laidlaw, Bena L. Currin, and Alan H. Barr. Cellular Texture Generation. Proceedings of SIGGRAPH, Computer Graphics, 29(4):239-248, August 1995. (pdf) (bibtex: Fleischer-1995-CTG). Craig Upson, Thomas Faulhaber Jr., David Kamins, David H. Laidlaw, David Schlegel, Jeffrey Vroom, Robert Gurwitz, and Andries van Dam. The Application Visualization System: A Computational Environment for Scientific Visualization. IEEE Computer Graphics and Applications, 9(4):30-42, July 1989. (pdf) (bibtex: Upson-1989-AVS). E.L. Dumon and Sharon Swartz. Biomechanical Approaches and Ecological Research. In Ecological and Behavioral Methods for the Study of Bats. Johns Hopkins university Press, 2006. In Press (bibtex: Dumont-2006-BAE). R. Galvao, E. Israeli, A. Song, X. Tian, K. Bishop, Sharon Swartz, and Kenneth Breuer. The Aerodynamics of Compliant Membrane Wings Modeled on Mammalian Flight Mechanics. In Proceedings of 36th AIAA Fluid Dynamics Conference, June 2006. (bibtex: Galvao-2006-ACM). X. Tian, J. Iriarte, K. Middleton, R. Galvao, E. Israeli, A. Roemer, A. Sullivan, A. Song, Sharon Swartz, and Kenneth Breuer. Direct Measurements of the Kinematics and Dynamics of Bat Flight. In Proceedings of 36th AIAA Fluid Dynamics Conference, June 2006. (bibtex: Tian-2006-DMK). Karin M. Viergever, Iain Woodhouse, and Neil Stuart. Airborne Synthetic Aperture Radar for Estimating Above-ground Woody Biomass in Tropical Savanna Woodland: A case study in Belize. In Proceedings of the International Geoscience And Remote Sensing Symposium, Denver, CO, 2006. (bibtex: Viergever-2006-ASA). I.D. Cameron, E.D. Wallington, K. Viergever, D. Moss, Iain Woodhouse, and N. Stuart. Synthetic Aperture Radar for Neo-tropical Botanical Inventory and Vegetation Height Retrieval. In Proceedings of the EARSeL Symposium, Porto, Portugal, 2005. (bibtex: Cameron-2005-SAR). Dean Turner. The Visualization of Polarimetric Radar Data. PhD thesis, University of Edinburgh, 2005. (pdf) (bibtex: Turner-2005-VPR). Sharon Swartz, K. Bishop, and M.F. Ismael-Aguirre. Dynamic complexity of wing form in bats: implications for flight performance. In Functional and evolutionary ecology of bats. Oxford Press, 2004. (bibtex: Swartz-2004-DCW). Higher Learning Magazine. The SHAPE Lab. Higher Learning Magazine, May/June 2003. (pdf) (bibtex: Shape-2003-SHA). J-S. Lee, S.R. Cloude, K. P. Papathanassiou, M.R. Grunes, and Iain Woodhouse. Speckle Filtering and Coherence Estimation of Polarimetric SAR Interferometry Data for Forest Applications. IEEE Transactions on Geoscience and Remote Sensing, 41(10):2254-2263, 2003. (bibtex: Lee-2003-SFC). Sharon Swartz, P. Freeman, and E. Stockwell. Ecomorphology. In Bat Ecology, pages 257-300. The University of Chicago Press, 2003. (bibtex: Swartz-2003-ECO). P. Watts, E. J. Mitchell, and Sharon Swartz. A computer model for estimating mechanics and energetics of horizontal flapping flight in large bats: Model description, computation, and sensitivity analysis. Journal of Experimental Biology, 204:2873-2898, 2001. (bibtex: Watts-2001-CME). Jen Grey. Daniel Keefe, Cavepainter. ACM SIGGRAPH Arts, October 2007. (pdf) (bibtex: Grey-2007-DKC). Roland Piquepaille. Drawing on Air with Haptics in 3D. Slashdot.com, September 2007. (pdf) (bibtex: Piquepaille-2007-DAH). Tracy Staedter. New Tech Lets You Draw in the Air. Discovery News, October 2007. (pdf) (bibtex: Staedter-2007-NTL). Haydar Taygun. CSers develop new 3D design tool. Brown Daily Herald, October 2007. (pdf) (bibtex: Taygun-2007-CDN). A. Hedenstrom, M. Rosen, and G. R. Spedding. Vortex wakes generated by robins Erithacus rubecula during free flight in a wind tunnel. Journal of The Royal Society Interface, 3(7):263-276, April 2006. (bibtex: Hedenstrom-2006-VWG). G. R. Spedding and J. McArthur. Deducing Aerodynamic Mechanisms from Near- and Far-Wake Measurements of Fixed and Flapping Wings at Moderate Reynolds Number. In Proceedings of the 44th AIAA Aerospace Sciences Meeting and Exhibit, Reno, Nevada, January 2006. AIAA. (bibtex: Spedding-2006-DAM). Timothy Urness, Victoria Interrante, Ellen Longmire, Ivan Marusic, Sean O�Neill, and Thomas W. Jones. Strategies for the Visualization of Multiple 2D Vector Fields. IEEE Computer Graphics and Applications, 26(4):74-82, July/August 2006. (pdf) (bibtex: Urness-2006-SVM). Love, A.L., Pang, A., Kao, and D.L. Visualizing spatial multivalue data. IEEE Computer Graphics and Applications, 25(3):69-79, May-June 2005. (pdf) (bibtex: Love-2005-VSM). Giovanni Maria Carlomagno. Colours in a complex fluid flow. Optics and Laser Technology, 2005. (pdf) (bibtex: Carlomagno-2005-CCF). European Space Agency. Global Earth Observation System of Systems, 10 year Implementation Plan Reference Document. ESA Publications Division, Feb 2005. (bibtex: ESA-2005-GEO). David Kinnear, Mark Atherton, Michael Collins, Jason Dokhan, and Tassos Karayiannis. Colour in visualisation for computational fluid dynamics. Optics and Laser Technology, 2005. (pdf) (bibtex: Kinnear-2005-CVC). Peter Stuecke and Christoph Egbers. Visualization of scavenging flow in the design of small two-stroke engines. Optics and Laser Technology, 2005. (pdf) (bibtex: Stuecke-2005-VSF). Mathew T. Wilkinson, David M. Unwin, and Charles P. Ellington. High Lift function of the Pteroid Bone and Forewing of Pterosaurs. Proceedings of the Royal Society, Online, 2005. (pdf) (bibtex: Wilkinson-2005-HLF). I.M. Fischer and Sharon Swartz. How fat bats fly: Energetic and structural consequences for bats flying under increased load. Functional Ecology, 2004. In Review (bibtex: Fischer-2004-HFB). Schmidt, G.S., Chen, S.L., Bryden, A.N., Livingston, M.A., Rosenblum, L.J., Osborn, and B.R. Multidimensional visual representations for underwater environmental uncertainty. IEEE Computer Graphics and Applications, 24(5):56-65, September-October 2004. (pdf) (bibtex: Schmidt-2004-MVR). Deborah Halber. Fishy fun with fluid dynamics. TechTalk, MIT News Office, February 2004. (pdf) (bibtex: Halber-2004-FFF). M.H. Huber and Sharon Swartz. Wings of springs: Structure, function and energetics of bat finger bones. Unpublished (bibtex: Huber-2004-WSS), 2004. Christopher R. Johnson and Charles D. Hansen. Visualization Handbook. Academic Press, June 2004. (bibtex: Johnson-2004-VHA). David Laidlaw, Sharon Swartz, George Karniadakis, and Peter Richardson. Understanding Unsteady Bioflows through Simulation, Modeling, Visualization, Art, and Psychology. NSF-ITR grant proposal, 2004. (pdf) (bibtex: Laidlaw-2004-UUB). J-S. Lee, M.R. Grunes, E. Pottier, and L. Ferro-Famil. Unsupervised Terrain Classification Preserving Polarimetric Scattering Characteristics. IEEE Transactions on Geoscience and Remote Sensing, 42:722-731, 2004. (bibtex: Lee-2004-UTC). Ghislain Picard, T. Le Toan, and S. Quegan. A Three-dimensional Radiative Transfer Model to Interpret Ranging Scatterometer Measurements from a Pine Forest. Waves Random Media, 14:S317-S331, 2004. (bibtex: Picard-2004-TDR). M. Samimy, K.S. Breuer, L.G. Leal, and P.H. Steen. A Gallery of Fluid Motion. Cambridge University Press, January 2004. (bibtex: Samimy-2004-GFM). Maribel Yasmina Santos and Luis Alfredo Amaral. Mining geo-referenced data with qualitative spatial reasoning strategies. Computers and Graphics, 28(3):371-379, June 2004. (pdf) (bibtex: Santos-2004-MGD). J.A. Skene and Sharon Swartz. The mechanical and energetic role of the wing membrane in bat flight. Unpublished (bibtex: Skene-2004-MER), 2004. G. R. Spedding, M. Rosen, A. Hedenstrom, and J. McArthur. Force Measurements and Flow Structure for Fixed and Flapping Wings at Low Reynolds Number. In Proceedings of the 11th International Symposium on Flow Visualization, Notre Dame, Indiana, August 2004. (bibtex: Spedding-2004-FMF). Sharon Swartz. Computational estimation of skeletal stresses and joint forces in flying bats: implications for origin and diversification of the bat skeleton. Unpublished (bibtex: Swartz-2004-CES), 2004. Sharon Swartz and S. M. Gilbert. The structural geometry of bat wing bones and the risk of buckling failure. Journal of Theoretical Biology, 2004. In Review (bibtex: Swartz-2004-SGB). R. M. Alexander. Principles of Animal Locomotion. Princeton University Press, 2003. (bibtex: Alexander-2003-PAL). Bonnell, Duchaineau, Schikore, Hamann, and Joy. Material Interface Reconstruction. IEEE Transactions on Visualization and Computer Graphics, 340, 2003. (pdf) (bibtex: Bonnell-2003-MIR). Mary Jo Curtis. Scientists and artists partner to create virtual Petra. George Street Journal, 27, February 2003. (pdf) (bibtex: Curtis-2003-SAP). E.G. Drucker and G. V. Lauder. Function of pectoral fins in rainbow trout: behavioral repertoire and hydrodynamic forces. J. Exp. Biol., 206:813-826, 2003. (bibtex: Drucker-2003-FPF). L. Ferry-Graham, P.C. Wainwright, and G. V. Lauder. Quantification of flow during suction feeding in bluegill sunfish. Zoology, 106:159-168, 2003. (bibtex: Ferry-2003-QFD). William T. Freeman, Joshua B. Tenenbaum, and Egon C. Pasztor. Learning Style Translation for the Lines of a Drawing. ACM Transactions on Graphics, 22(1):33-46, January 2003. (pdf) (bibtex: Freeman-2003-LST). I. Hajnsek, E. Pottier, and S.R. Cloude. Inversion of Surface Parameters from Polarimetric SAR. IEEE Transactions on Geoscience and Remote Sensing, 41:727-744, 2003. (bibtex: Hajnsek-2003-ISP). Ming Jiang, Raghu Machiraju, and David Thompson. Detection and Visualization of Vortices. In Visualization Handbook. Academic Press, 2003. Unpublished (pdf) (bibtex: Jiang-2003-DAV). J.M. Kellndorfer, M.C. Dobson, J.D. Vona, and M. Clutter. Toward Precision Forestry Plot-level Parameter Retrieval for Slash Pine PLantations with JPL AIRSAR. IEEE Transactions on Geoscience and Remote Sensing, 41:1571-1582, July 2003. (bibtex: Kellndorfer-2003-TPF). J.C. Liao, D.N. Beal, G.V. Lauder, and M.S. Triantafyllou. The Karman gait: novel body kinematics of rainbow trout swimming in a vortex street. J. Exp. Biol., 206:1059-1073, 2003. (bibtex: Liao-2003-KGN). J.C. Liao, D. N. Beal, G. V. Lauder, and M. S. Triantafyllou. Fish exploiting vortices decrease muscle activity. Science, 302:1566-1569, 2003. (bibtex: Liao-2003-FEV). T. Mette, K.P. Papathanassiou, I. Hajnsek, and R. Zimmermann. Forest Biomass Estimation using Polarimetric SAR Interferometry. In Proceedings of PolInSAR 2003, Frascati, Italy, 2003. (bibtex: Mette-2003-FBE). D.G. Pelli, B. Farell, and D. C. Moore. The remarkable inefficiency of word recognition. Nature, 423:752-756, June 2003. (pdf) (bibtex: Pelli-2003-RIW). Christian Sigg, Ronald Peikert, and Markus Gross. Signed Distance Transform Using Graphics Hardware. In IEEE Vis2003, 2003. (pdf) (bibtex: Sigg-2003-SDT). G.R. Spedding, A. Hedenstrom, and M. Rosen. Quantitative studies of the wakes of freely flying birds in a low-turbulence wind tunnel. Experiments in Fluids, 34(2):291-303, 2003. (bibtex: Spedding-2003-QSW). H. Theisel and H.-P. Seidel. Feature Flow Fields. In Joint EUROGRAPHICS—IEEE TCVG Symposium on Visualization, 2003. (pdf) (bibtex: Theisel-2003-FFF). B.W. Tobalske, T.L. Hedrick, K.P. Dial, and A.A. Biewener. Comparative power curves in bird flight. Nature, 421:363-366, 2003. (bibtex: Tobalske-2003-CPC). S. Vogel. Comparative Biomechanics. Princeton University Press, 2003. (bibtex: Vogel-2003-CBI). Mehdi Dastani. The Role of Visual Perception in Data Visualization. Journal of Visual Languages and Computing, 13(6):601-622, December 2002. (pdf) (bibtex: Dastani-2002-RVP). E. G. Drucker and G. V. Lauder. Experimental hydrodynamics of fish locomotion: functional insights from wake visualization . Integ. Comp. Biol., 42:243-257, 2002. (bibtex: Drucker-2002-EHF). E.G. Drucker and G. V. Lauder. Wake dynamics and locomotor function in fishes: interpreting evolutionary patterns in pectoral fin design. Integ. Comp. Biol., 42:997-1008, 2002. (bibtex: Drucker-2002-WDL). Felice Frankel. Envisioning Science: The Design and Craft of the Science Image. MIT Press, March 2002. (bibtex: Frankel-2002-ESC). Chris Harding, Ioannis A.Kakadiaris, John F.Casey, and R.Bowen Loftin. A Multi-Sensory System for the investigation of Geoscientific Data. Computers and Graphics, 26:259-269, 2002. (pdf) (bibtex: Harding-2002-MSS). Brian Hayes. The World According to Wolfram. American Scientist, 90(4):308-312, July/August 2002. (pdf) (bibtex: Hayes-2002-TWA). T.L. Hedrick, B.W. Tobalske, and A.A. Biewener. Estimates of circulation and gait change based on a three-dimensional kinematic analysis of flight in cockatiels (Nymphicus hollandicus) and ringed turtle doves (Streptopelia risoria). Journal of Experimental Biology, 205:1389-1409, 2002. (bibtex: Hedrick-2002-ECG). Constance Holden. Random Samples: Painterly Data. Science Magazine, 298(5594):739, October 2002. (pdf) (bibtex: Holden-2002-RSA). D. House and C. Ware. A method for perceptual optimization of complex Visualizations. In Proceedings of Advanced Visual Interface, May 2002. (pdf) (bibtex: House-2002-AMF). Ming Jiang, Raghu Machiraju, and David Thompson. A Novel Approach To Vortex Core Region Detection. In Eurographics—IEEE TCVG Symposium on Visualization, 2002. (pdf) (bibtex: Jiang-2002-ANA). Ming Jiang, Raghu Machiraju, and David Thompson. Geometric verification of swirling features in flow fields. In Proceedings of the conference on Visualization, pages 307-314, Piscataway, NJ, USA, 2002. ITCVG, IEEE Press. (pdf) (bibtex: Jiang-2002-GVS). G.V. Lauder, E.G. Drucker, J. Nauen, and C.D. Wilga. Experimental hydrodynamics and evolution: caudal fin locomotion in fishes. In Vertebrate Biomechanics and Evolution, pages 117-135. Bios Scientific Publishers, 2002. (bibtex: Lauder-2002-EHE). G.V. Lauder, J. Nauen, and E. G. Drucker. Experimental hydrodynamics and evolution: function of median fins in ray-finned fishes. Integ. Comp. Biol., 42:1009-1017, 2002. (bibtex: Lauder-2002-EHF). G. V. Lauder and E. G. Drucker. Forces, fishes, and fluids: hydrodynamic mechanisms of aquatic locomotion. News in Physiological Sciences, 17:235-240, 2002. (bibtex: Lauder-2002-FFF). G.V. Lauder. The intellectual challenge of biomechanics and evolution. In Vertebrate Biomechanics and Evolution, pages 319-325. Bios Scientific Publishers, 2002. (bibtex: Lauder-2002-ICB). J.C. Nauen and G. V. Lauder. Hydrodynamics of caudal fin locomotion by chub mackerel, Scomber japonicus (Scombridae). Journal of Experimental Biology, 205:1709-1724, 2002. (bibtex: Nauen-2002-HCF). J.C. Nauen and G. V. Lauder. Quantification of the wake of rainbow trout (Oncorhynchus mykiss) using three-dimensional stereoscopic digital particle image velocimetry. J. Exp. Biol., 205:3271-3279, 2002. (bibtex: Nauen-2002-QWR). Leen-Kiat Soh and Costas Tsatsoulis. ARKTOS: A knowledge engineering software tool for images. International Journal of Human-Computer Studies, 57:469-496, 2002. (pdf) (bibtex: Soh-2002-AKE). Russell M. Taylor II. Visualizing Multiple Scalar Fields on the Same Surface. IEEE Computer Graphics and Applications, 22(2):6-10, March-April 2002. (pdf) (bibtex: Taylor-2002-VMS). E.C. Teeling. Microbat paraphyly and the convergent evolution of a key innovation in Old World rhinolophoid microbats. Proceedings of the National Academy of Sciences of the United States of America, 99(3):1431-1436, 2002. (bibtex: Teeling-2002-MPC). E.D. Tytell and G. V. Lauder. Muscle activity patterns in the escape response of Polypterus senegalus: variation during stage 1 and 2. J. Exp. Biol., 205:2591-2603, 2002. (bibtex: Tytell-2002-MAP). C. Varekamp and D.H. Hoekman. High-resolution InSAR image Simulation for Forest Canopies. IEEE Transactions on Geoscience and Remote Sensing, 40(7):1648-1655, 2002. (bibtex: Varekamp-2002-HRI). C. D. Wilga and G. V. Lauder. Function of the heterocercal tail in sharks: quantitative wake dynamics during steady horizontal swimming and vertical maneuvering. Journal of Experimental Biology, 205:2365-2374, 2002. (bibtex: Wilga-2002-FHT). A. Wong, R. Hsieh, and P. Athos. Investigative Tools for Arterial Flow in the CAVE. Class Report for CS237 Fall 2002, December 2002. Unpublished (pdf) (bibtex: Wong-2002-ITA). Paroma Basu. The Virtual Voyager. The MIT Technology Review, September 2001. (pdf) (bibtex: Basu-2001-TVV). E. G. Drucker and G. V. Lauder. Locomotor function of the dorsal fin in teleost fishes: experimental analysis of wake forces in sunfish. J. Exp. Biol., 204:2943-2958, 2001. (bibtex: Drucker-2001-LFD). E. G. Drucker and G. V. Lauder. Wake dynamics and fluid forces of turning maneuvers in sunfish. J. Exp. Biol., 204:431-442, 2001. (bibtex: Drucker-2001-WDF). D.J. Duke and I. Herman. Minimal Graphics. Computer Graphics and Applications, 21(6), 2001. (bibtex: Duke-2001-MGR). L. Ferry-Graham and G.V. Lauder. Aquatic prey capture in ray-finned fishes: a century of progress and new directions. J. Morph., 248:99-119, 2001. (bibtex: Ferry-2001-APC). C.G. Healey. Combining Perception and Impressionist Techniques for Nonphotorealistic Visualization of Multidimensional Data. In SIGGRAPH 2001 Course 32: Nonphotorealistic Rendering in Scientific Visualization, pages 20-52, 2001. (pdf) (bibtex: Healey-2001-CPI). T. J. Jankun-Kelly and Kwan-Liu Ma. Visualization Exploration and Encapsulation via a Spreadsheet-Like Interface. IEEE Transactions on Visualization and Computer Graphics, 7(3):275-287, July-September 2001. (bibtex: Jankun-2001-VEE). Falko Kuester, Ralph Bruckschen, Bernd Hamann, and Kenneth I. Joy. Visualization of Particle Traces in Virtual Environments. In Symposium on Virtual Reality Software and Technology, pages 151-157. ACM, November 2001. (pdf) (bibtex: kuester-2001-PVE). G.V. Lauder. Flight of the Robofly (News and Views). Nature, 412:688-689, 2001. (bibtex: Lauder-2001-FRN). Kwan-Liu Ma, Aaron Hertzmann, Victoria Interrante, and Eric B. Lum. Recent Advances in Non-Photorealistic Rendering for Art and Visualization. In SIGGRAPH 2002 Course Notes. Course 23., August 2002. (pdf) (bibtex: Ma-2001-RAN). W.J. Murphy. Resolution of the early placental mammal radiation using Bayesian phylogenetics. Science, 294(5550):2348-2351, 2001. (bibtex: Murphy-2001-REP). Rajehndra Nagappan. Employing Virtual Enviroments for Data Visualisation. In Proceedings of SimTecT, May 2001. (doc) (bibtex: Nagappan-2001-EVE). Rajehndra Nagappan. A Compositional Model for Multidimensional Data Visualisation. In In Proceedings of SPIE, Visual Data Exploration and Analysis VIII, pages 156-167, January 2001. (pdf) (bibtex: Nagappan-2001-ACM). J. C. Nauen and G. V. Lauder. Locomotion in scombrid fishes: visualization of flow around the caudal peduncle and finlets of the Chub mackerel Scomber japonicus. J. Exp. Biol., 204:2251-2263, 2001. (bibtex: Nauen-2001-LSF). J.C. Nauen and G.V. Lauder. Three-dimensional analysis of finlet kinematics in the chub mackerel, Scomber japonicus. Biol. Bull., 200:9-19, 2001. (bibtex: Nauen-2001-TDA). Georgios Papaioannou, Evaggelia-Aggeliki Karabassi, and Theoharis Theoharis. Virtual Archaeologist: Assembling the Past. IEEE Computer Graphics and Applications, pages 53-59, March/April 2001. (bibtex: Papaioannou-2001-VAA). J.M.V. Rayner, P.W. Viscardi, S. Ward, and J.R. Speakman. Aerodynamics and energetics of intermittent flight in birds. American Zoologist, 41:188-204, 2001. (bibtex: Rayner-2001-AEI). Leslie Denise Pinnel Salisbury. Automatic Visual Display Design and Creation. PhD thesis, Department of Computer Science and Engineering, University of Washington, 2001. (pdf) (bibtex: Pinnel-2001-AVD). S. Simoff. Towards the development of environments for designing visualisation support for visual data mining. In Proceedings International Workshop on Visual Data Mining, pages 93-106, 2001. (bibtex: Simoff-2001-TDE). G. R. Spedding and C.J. Pennycuick. Uncertainty calculations for theoretical flight power curves. Journal of Theoretical Biology, 208(2):127-139, 2001. (bibtex: Spedding-2001-UCT). M.S. Springer. Integrated fossil and molecular data reconstruct bat echolocation. Proceedings of the National Academy of Sciences of the United States of America, 98(11):6241-6246, 2001. (bibtex: Springer-2001-IFM). Jos Stam. A Simple Fluid Solver based on the FFT. Journal of Graphics Tools, 6(2):43-52, 2001. (pdf) (bibtex: Stam-2001-SFS). E.F. Stockwell. Morphology and flight manoeuvrability in New World leaf-nosed bats (Chiroptera : Phyllostomidae). Journal of Zoology, 254:505-514, 2001. (bibtex: Stockwell-2001-MFM). C.D. Wilga and G.V. Lauder. Functional morphology of the pectoral fins in bamboo sharks, Chiloscyllium plagiosum: benthic versus pelagic station holding. J. Morphol., 249:195-209, 2001. (bibtex: Wilga-2001-FMP). Julio Bermudez, Jim Agutter, Dwayne Westenskow, Stefano Foresti, Yi Zhang, Debra Gondeck-Becker, Noah Syroid, Brent Lilly, David Strayer, and Frank Drews. Data Representation Architecture. Visualization Design Methods, Theory and Technology Applied to Anesthesiology. In Proceedings of ACADIA 2000, 2000. (pdf) (bibtex: Bermudez-2000-DRA). K.S. Breuer, J.R. Koseff, K. Powell, and C. Robertson. Multimedia Fluid Mechanics. Cambridge University Press, CD-ROM edition, January 2000. (bibtex: Breuer-2000-MFM). Stephen Chenney and D. A. Forsyth. Sampling Plausible Solutions to Multi-body Constraint Problems. In Proceedings of ACM SIGGRAPH, pages 219-228. ACM Press, 2000. (pdf) (bibtex: Chenney-2000-SPS). E.G. Drucker and G.V. Lauder. A hydrodynamic analysis of fish swimming speed: wake structure and locomotor force in slow and fast labriform swimmers. J. Exp. Biol., 203:2379-2393, 2000. (bibtex: Drucker-2000-HAF). R. Dudley. The biomechanics of insect flight: form, function, evolution. Princeton University Press, 2000. (bibtex: Dudley-2000-BIF). S. G. Eick. Visual Discovery and Analysis. IEEE Transactions on Visualization and Computer Graphics, 6(1):44-58, 2000. (pdf) (bibtex: Eick-2000-VDA). Heitsch, Koehler, Martens, and Moldt. High-level Petri Nets for a Model of Organizational Decision Making. CiteSeer, 2000. (pdf) (bibtex: Heitsch-2000-HPN). Johanna Hyrkas. Scientific Visualization. Technical report, Helsinky University of Technology, Telecommunications Software and Multimedia Laboratory, April 2000. (pdf) (bibtex: Hyrkas-2000-SVI). Victoria Interrante. Harnessing Natural Textures for Multivariate Visualization. IEEE Computer Graphics and Applications, 20(6):6-11, November/December 2000. (pdf) (bibtex: Interrante-2000-HNT). Claire Knight and Malcolm Munro. Mindless Visualizations. In 6th ERCIM Workshop: User Interfaces for All, October 2000. (pdf) (bibtex: Knight-2000-MVI). Koehler, Langer, Moldt, and Roelke. Combining the Sociological Theory of Bourdieu with Multi Agent Systems. In Proceedings of MASHO, 2000. (pdf) (bibtex: Koehler-2000-STB). G.V. Lauder. Function of the caudal fin during locomotion in fishes: kinematics, flow visualization, and evolutionary patterns. Amer. Zool., 40:101-122, 2000. (bibtex: Lauder-2000-FCF). G.V. Lauder. Biomechanics and behavior: analyzing the mechanistic basis of movement from an evolutionary perspective. In Biomechanics in Animal Behavior, pages 19-32. Bios Scientific Publishers, Oxford, 2000. (bibtex: Lauder-2000-BBA). J. Liao and G. V. Lauder. Function of the heterocercal tail in white sturgeon: flow visualization during steady swimming and vertical maneuvering. J. Exp. Biol., 203:3585-3594, 2000. (bibtex: Liao-2000-FHT). Rajehndra Nagappan. Visualising Multidimensional Non-Geometric Data Sets. In Proceedings of SPIE, Visual Data Exploration and Analysis VII, volume 3960, pages 26-34, January 2000. (pdf) (bibtex: Nagappan-2000-VMN). Rajehndra Nagappan. Exploring Visualisations through Subspace Composition. In Proceedings of the First Australasian User Interface Conference, February 2000. (pdf) (bibtex: Nagappan-2000-EVT). Rajehndra Nagappan. A Graph-based Model for Navigating Visualisation. In Proceedings of Visual Information Processing, December 2000. (pdf) (bibtex: Nagappan-2000-AGM). J.C. Nauen and G.V. Lauder. Locomotion in scombrid fishes: morphology and kinematics of the finlets of the chub mackerel, Scomber japonicus. J. Exp. Biol., 203:2247-2259, 2000. (bibtex: Nauen-2000-LSF). E.C. Teeling. Molecular evidence regarding the origin of echolocation and flight in bats. Nature, 403(6766):188-192, 2000. (bibtex: Teeling-2000-MER). B.W. Tobalske. Biomechanics and physiology of gait selection in flying birds. Physiological and Biochemical Zoology, 73(6):736-750, 2000. (bibtex: Tobalske-2000-BPG). J. A. Walker and M. W. Westneat. Mechanical performance of aquatic rowing and flying. Proc. Roy. Soc. Lond. B, 267:1875-1881, 2000. (bibtex: Walker-2000-MPA). Colin Ware. Information Visualization: Perception for Design. Morgan Kaufmann Publishers, 2000. (bibtex: Ware-2000-IVP). Colin Ware and Glenn Franck. Evaluating Stereo and Motion Cues for Visualizing Information Nets in Three Dimensions. ACM Transactions on Graphics, 15(2):121-140, April 2000. (pdf) (bibtex: Ware-2000-ESA). C.D. Wilga and G.V Lauder. Three-dimensional kinematics and wake structure of the pectoral fins during locomotion in leopard sharks. J. Exp. Biol., 203:2261-2278, 2000. (bibtex: Wilga-2000-TDK). Gennady Andrienko and Natalia Andrienko. Data characterization schema for intelligent support in visual data analysis. In Lecture Notes in Computer Science, pages 349-366. Springer-verlag, 1999. (pdf) (bibtex: Andrienko-1999-DCS). Rajesh Batra and Lambertus Hesselink. Feature Comparison of 3-D Vector Fields Using Earth Mover's Distance. In IEEE Visualization, pages 105-�111, 1999. (pdf) (bibtex: Batra-1999-FCO). Frederic P. Brooks Jr. What's Real about Virtual Reality. IEEE Computer Graphics and Applications, 19(6):16-27, November/December 1999. (pdf) (bibtex: Brooks-1999-WRV). S.R. Cloude, J. Fortuny, J.M. Lopez-Sanchez, and A.J. Sieber. Wide-band Polarimetric Radar Inversion Studies for Vegetation Layers. IEEE Transactions on Geoscience and Remote Sensing, 37:2430-2441, 1999. (bibtex: Cloude-1999-WBP). M. H. Dickinson, F.O. Lehmann, and S.P. Sane. Wing rotation and the aerodynamic basis of insect flight. Science, 284(5422):1954-1960, 1999. (bibtex: Dickinson-1999-WRA). E. G. Drucker and G. V. Lauder. Locomotor forces on a swimming fish: three-dimensional vortex wake dynamics quantified using digital particle image velocimetry. J. Exp. Biol., 202:2393-2412, 1999. (bibtex: Drucker-1999-LFS). A. E. Eiben, R. Hinterding, and Z. Michalewicz. Parameter control in evolutionary algorithms. IEEE Transactions on Evolutionary Computation, 3(2):124-141, 1999. (pdf) (ps) (bibtex: Eiben-1999-PCE). C.P. Ellington. The novel aerodynamics of insect flight: Applications to micro-air vehicles. Journal of Experimental Biology, 202(23):3439-3448, 1999. (bibtex: Ellington-1999-NAI). J. Fortuny and A.J. Sieber. Three-Dimensional Synthetic Aperture Radar Imaging of a Fir Tree: First Results. IEEE Transactions on Geoscience and Remote Sensing, 37:1006-1014, 1999. (bibtex: Fortuny-1999-TDS). Christopher G. Healey and James T. Enns. Large Datasets at a Glance: Combining Textures and Colors in Scientific Visualization. IEEE Transactions on Visualization and Computer Graphics, 5(2):145-167, April-June 1999. (pdf) (bibtex: Healey-1999-LDG). Christopher G. Healey, Robert St. Amant, and Mahmoud S. Elhaddad. ViA: A perceptual visualization assistant. In 28th Workshop on Advanced Imagery Pattern Recognition, 1999. (pdf) (bibtex: Healey-1999-VIA). Robert E. Horn. Visual Language: Global Communication for the 21st Century. MacRovu Inc., 1999. (bibtex: Horn-1999-VLG). Matthew C. Humphrey. A Graphical notation for the Design of Information Visualizations. 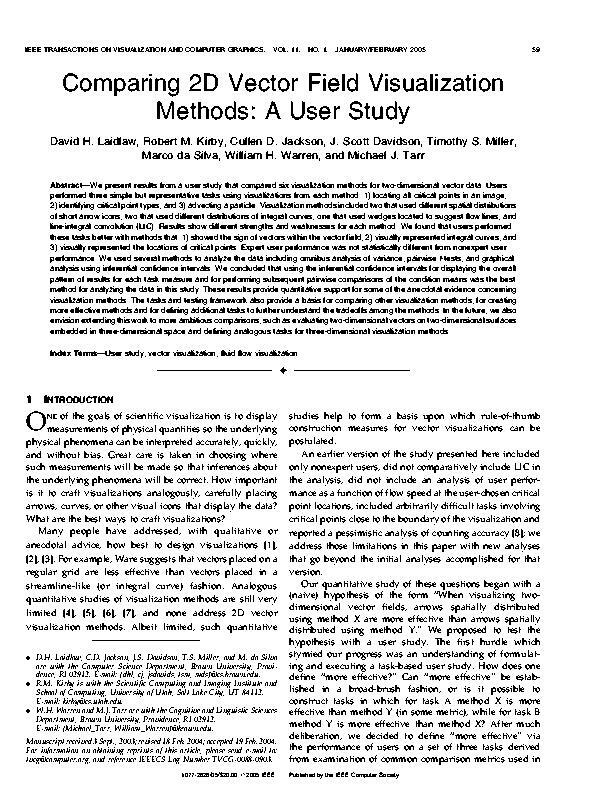 International Journal of Human-Computer Studies, 50:145-192, 1999. (pdf) (bibtex: Humphrey-1999-GND). Hans G. Kaper, Elizabeth Wiebel, and Sever Tipei. Data Sonification and Sound Visualization. Computing in Science and Engineering, pages 48-58, July/August 1999. (pdf) (bibtex: Kaper-1999-DSA). Rajehndra Nagappan and T. Lin. A Virtual Environment for Exploring Relational Information. In Proceedings of SimTecT, pages 313-318, March-April 1999. (doc) (bibtex: Nagappan-1999-AVE). E. Pottier and J-S. Lee. Application of the H/A/alpha Polarimetric Response Decomposition Theorem for Unsupervised Classification of Fully Polarimetric SAR Data based on the Wishart Distribution. In Proceedings of CEOS SAR Workshop, Toulouse, France, 1999. ESA Special Publication. (bibtex: Pottier-1999-AHP). J.M.V. Rayner. Estimating power curves of flying vertebrates. Journal of Experimental Biology, 202(23):3449-3461, 1999. (bibtex: Rayner-1999-EPC). B.W. Tobalske, W.L. Peacock, and K.P. Dial. Kinematics of flap-bounding flight in the zebra finch over a wide range of speeds. Journal of Experimental Biology, 202(13):1725-1739, 1999. (bibtex: Tobalske-1999-KFB). C.C. Voigt and Y. Winter. Energetic cost of hovering flight in nectar-feeding bats (Phyllostomidae : Glossophaginae) and its scaling in moths, birds and bats. Journal of Comparative Physiology B-Biochemical Systemic and Environmental Physiology, 169(1):38-48, 1999. (bibtex: Voigt-1999-ECH). Jiang Yu Zheng and Zhong Li Zhang. Virtual Recovery of Excavated Relics. IEEE Computer Graphics and Applications, pages 6-11, May/June 1999. (bibtex: Zheng-1999-VRE). D. Fensel, J. Angele, and R. Studer. The Knowledge Acquisition And Representation Language: KARL. IEEE Transactions on Knowledge and Data Engineering, 10(4):527-550, 1998. (pdf) (bibtex: Fensel-1998-KAR). A. L. Fuhrmann and E. Groller. Real-time techniques for 3D flow visualization. In IEEE Visualization '98, pages 305-312, 1998. (bibtex: fuhrmann-1998-RTT). Christopher G. Healey and James T. Enns. Building Perceptual Textures to Visualize Multidimensional Datasets. In Proceedings of IEEE Visualization, pages 111-118, 1998. (pdf) (bibtex: Healey-1998-BPT). Victoria Interrante and Chester Grosch. Visualizing 3D Flow. IEEE Computer Graphics and Applications, 18(4):49-53, July/August 1998. (pdf) (bibtex: Interrante-1998-V3F). Kai Muller, Ulrich Rist, and Siegfried Wagner. Enhanced Visualization of Late-Stage Transitional Structures using Vortex Identification and Automatic Feature Extraction. In Computational Fluid Dynamics, pages 786—791. John Wiley & Sons, 1998. (ps) (bibtex: Muller-1998-EVO). Jonathan C. Roberts. On Encouraging Multiple Views for Visualization. In IEEE Information Visualization, pages 8-14, July 1998. (pdf) (bibtex: Roberts-1998-EMV). Christopher D. Shaw, David S. Ebert, James M. Kukla, Amen Zwa, Ian Soboroff, and D. Aaron Roberts. Data Visualization Using Automatic, Perceptually-Motivated Shapes. In Visual Data Exploration and Analysis V, January 1998. (pdf) (bibtex: Shaw-1998-DVU). G.R. Spedding and P.B.S. Lissaman. Technical aspects of microscale flight systems. Journal of Avian Biology, 29(4):458-468, 1998. (bibtex: Spedding-1998-TAM). Sharon Swartz. Skin and bones: the mechanical properties of bat wing tissues . In Bats: Phylogeny, Morphology, Echolocation, and Conservation Biology, pages 109-126. Smithsonian Inst. Press, 1998. (bibtex: Swartz-1998-SBM). Y. Winter, C. Voigt, and O. Von Helversen. Gas exchange during hovering flight in a nectar-feeding bat Glossophaga soricina. Journal of Experimental Biology, 201(2):237-244, 1998. (bibtex: Winter-1998-GEH). Bill Buxton. Artists and the Art of the Luthier. Computer Graphics: The SIGGRAPH Quarterly, 31(1):10-11, 1997. (html) (bibtex: Buxton-1997-AAL). Felice Frankel and G. M. Whitesides. On the Surface of Things: Images of the Extraordinary in Science. Chronicle Books LLC, September 1997. (bibtex: Frankel-1997-OST). Issei Fujishiro, Yuriko Takeshima, Yoshihiko Ichikawa, and Kyoko Nakamura. GADGET: goal-oriented application design guidance for modular visualization environments. In IEEE Visualization, pages 245-252, 1997. (pdf) (bibtex: Fujishiro-1997-GAD). V. Interrante and C. Grosch. Strategies for effectively visualizing 3D flow with volume LIC. In IEEE Visualization '97, pages 421-424, November 1997. (pdf) (bibtex: interrante-1997-S3L). J. Jeong, F. Hussain, W. Schoppa, and J. Kim. Coherent Structures Near the Wall in a Turbulent Channel Flow. Journal of Fluid Mechanics, 332:185-214, 2002. (pdf) (bibtex: Jeong-1997-CSN). Susanne Lange. A Visualization Support Model. Technical Report 97.08, University of Leeds, 1997. (pdf) (bibtex: Lange-1997-VSM). Alan MacEachren and Menno-Jan Kraak. Exploratory Cartographic Visualization: Advancing the Agenda. Computers and Geosciences, 23(4):335-343, 1997. (pdf) (bibtex: MacEachren-1997-ECV). J. Marks, B. Andalman, P.A. Beardsley, W. Freeman, S. Gibson, J. Hodgins, T. Kang, B. Mirtich, H. Pfister, W. Ruml, K. Ryall, J. Seims, and S. Shieber. Design Galleries: A General Approach to Setting Parameters for Computer Graphics and Animation. In Proceedings of SIGGRAPH, pages 389-400. ACM Press, August 1997. (pdf) (bibtex: Marks-1997-DGA). Luis M. Portela. Identification and Characterization of Vortices in the Turbulent Boundary Layer. Volume I. PhD thesis, Stanford University, November 1997. (pdf) (bibtex: Portela-1997-ICV). L. M. Portela. 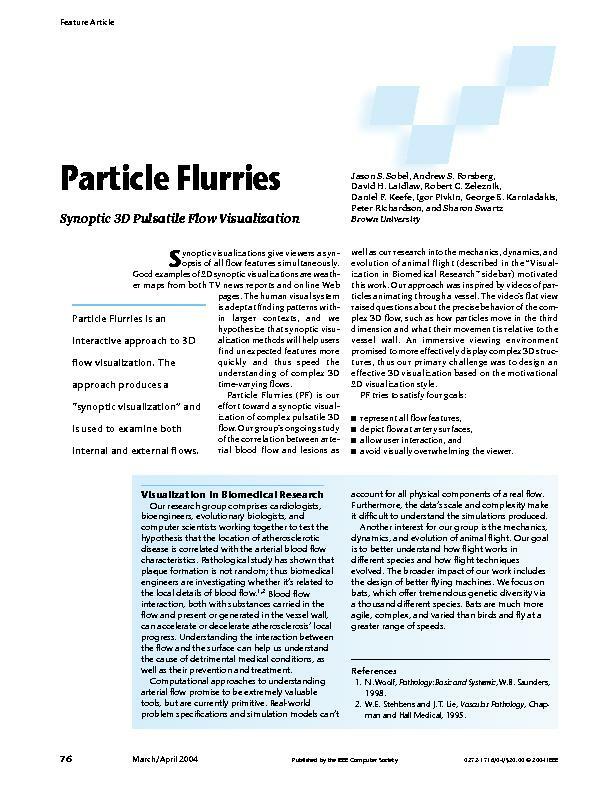 The Vortex Concept and its Identification in Turbulent Boundary Layer Flows. In Proceedings of IUTAM Symposium on Simulation and Identification of Organized Structures in Flows, pages 249-258, 1997. (pdf) (bibtex: Portela-1997-VCI). H. Sanglard and H.-H. Nageli. An End User Oriented Platform for Scientific Visualization. In IEEE Conference on Information Visualisation, pages 235-239, August 1997. (pdf) (bibtex: Sanglard-1997-EUO). Edward Tufte. Visual Explanations. Graphics Press, 1997. (bibtex: Tufte-1997-VEX). M. O. Ward. Creating and Manipulating N-Dimensional Brushes. In Proceedings of Joint Statistical Meeting, pages 6-14, August 1997. (pdf) (bibtex: Ward-1997-CMN). A.P. Willmott, C.P. Ellington, and A.L.R. Thomas. Flow visualization and unsteady aerodynamics in the flight of the hawkmoth, Manduca sexta. Philosophical Transactions of the Royal Society of London Series B-Biological Sciences, 352(1351):303-316, 1997. (bibtex: Willmott-1997-FVU). A.P. Willmott and C.P. Ellington. The mechanics of flight in the hawkmoth Manduca sexta .1. Kinematics of hovering and forward flight. Journal of Experimental Biology, 200(21):2705-2722, 1997. (bibtex: Willmott-1997-MFH). David H. Wolpert and William G. Macready. No Free Lunch Theorems for Optimization. IEEE Transactions on Evolutionary Computation, 1(1):67-82, April 1997. (ps) (bibtex: Wolpert-1997-NFL). Pak Chung Wong and R. Daniel Bergeron. 30 Years of Multidimensional Multivariate Visualization. In Scientific Visualization—Overviews, Methodologies and Techniques, pages 3-33. IEEE Computer Society Press, Los Alamitos, CA, 1997. (pdf) (bibtex: Wong-1997-3YM). Frederick P. Brooks. The Computer Scientist as a Toolsmith II. Communications of the ACM, 39(3):61-68, March 1996. (pdf) (bibtex: Brooks-1996-TCS). M.H. Dickinson. Unsteady mechanisms of force generation in aquatic and aerial locomotion. American Zoologist, 36(6):537-554, 1996. (bibtex: Dickinson-1996-UMF). C. P. Ellington. Leading-edge vortices in insect flight. Nature, 384(6610):626-630, 1996. (bibtex: Ellington-1996-LEV). B.W. Tobalske and K.P. Dial. Flight kinematics of black-billed magpies and pigeons over a wide range of speeds. Journal of Experimental Biology, 199(2):263-280, 1996. (bibtex: Tobalske-1996-FKB). Takeo Watanabe and Patrick Cavanagh. Texture Laciness: the Texture Equivalent of Transparency? Perception, 25(3):293-303, March 1996. (pdf) (bibtex: Watanabe-1996-TLT). M. W. Westneat. Functional morphology of aquatic flight in fishes: kinematics, electromyography, and mechanical modeling of labriform locomotion. Amer. Zool., 36:582-598, 1996. (bibtex: Westneat-1996-FMA). M. Zockler, D. Stalling, and H Hege. Interactive visualizations of 3D-Vector fields using illuminated streamlines. In IEEE Visualization '96, October 1996. (bibtex: zockler-1996-IV3). M. Zockler, D. Stalling, and H.C. Hege. Interactive Visualization Of 3D-Vector Fields Using Illuminated Stream Lines. In Proceedings of IEEE Visualization, pages 107-113. IEEE, Oct/Nov 1996. (pdf) (ps) (bibtex: Zockler-1996-IVO). A.E. Eiben. Multi-parent Recombination, chapter 3.7. IOP Publishing Ltd and Oxford University Press, 1995. (pdf) (ps) (bibtex: Eiben-1995-MPR). Stephen G. Eick. Engineering Perceptually Effective Visualizations for Abstract Data. In Scientific Visualization Overviews, Methodologies and Techniques, pages 191-210. IEEE Computer Science Press, 1995. (pdf) (bibtex: Eick-1995-EPE). Jinhee Jeong and Fazle Hussain. On the Identification of a Vortex. Journal of Fluid Mechanics, pages 69-94, 285 1995. (pdf) (bibtex: Jeong-1995-OIV). S. Lange, H. Schumann, W. Muller, and D. Kromker. Problem-oriented visualisation of multi-dimensional data sets. In Proceedings of the International Symposium and Scientific Visualization, pages 1-15, 1995. (pdf) (bibtex: Lange-1995-POV). Naim Laper. Mix and Match: A Construction Kit for Scientific Visualization. PhD thesis, University of California Santa Cruz, March 1995. (pdf) (bibtex: Alper-1995-MMC). Baker, M.P., Bushell, and C. After the storm: considerations for information visualization. IEEE Computer Graphics and Applications, 15(3), May 1995. (pdf) (bibtex: Baker-1995-ASC). Alan MacEachren. How Maps Work. The Guilford Press, New York, NY, 1995. (bibtex: MacEachren-1995-HMW). Colin Ware and William Knight. Using visual texture for information display. ACM Transactions on Graphics, 14(1):3-20, 1995. (pdf) (bibtex: Ware-1995-UVT). David H. Wolpert and William G. Macready. No Free Lunch Theorems for Search. Technical Report SFI-TR-95-02-010, The Santa Fe Institute, Santa Fe, NM, 1995. (ps) (bibtex: Wolpert-1995-NFL). Jarmo T. Alander. Genetic Algorithms Bibliography. Unpublished (pdf) (bibtex: Alander-1994-GAB), 1994. A. Gibb, B. C. Jayne, and G. V. Lauder. Kinematics of pectoral fin locomotion in the bluegill sunfish Lepomis macrochirus. J. Exp. Biol., 189:133-161, 1994. (bibtex: Gibb-1994-KPF). Alan MacEachren. Some Truth with Maps: A Primer in Symbolization and Design. Association of American Geographers, Washington, DC, 1994. (bibtex: MacEachren-1994-STM). Alex Pang and Naim Alper. Mix and match: A construction kit for visualization. In Proceedings of IEEE Visualization 1994, pages 302-309. IEEE Computer Society Press, October 1994. (pdf) (bibtex: Pang-1994-MMC). W. Ribarsky, E. Ayers, J. Eble, and S. Mukherjea. Glyphmaker: Creating Customized Visualizations of Complex Data. IEEE Computer, pages 57-64, July 1994. (pdf) (bibtex: Ribarsky-1994-GCC). Hikmet Senay and Eve Ignatius. A Knowledge-Based System for Visualization Design. IEEE Computer Graphics and Applications, 14(6):36-47, November 1994. (pdf) (bibtex: Senay-1994-KBS). Karl Sims. Evolving 3D Morphology and Behavior by Competition. In Artificial Life IV Proceedings, pages 28-39. MIT Press, 1994. (pdf) (bibtex: Sims-1994-E3M). Karl Sims. Evolving Virtual Creatures. In Proceedings of SIGGRAPH, pages 15-22. ACM Press, July 1994. (pdf) (bibtex: Sims-1994-EVC). S. Vogel. Life in Moving Fluids. The physical biology of flow. Princeton University Press, second edition, 1994. (bibtex: Vogel-1994-LMF). S. Vogel. Nature's Pumps. Amer. Sci., 82:464-471, 1994. (bibtex: Vogel-1994-NPU). Alan Brenner. Cartographic Symbolization and Design: ARC/INFO Methods. Publication of the Office of Information Resources Management of the US EPA, 1993. (pdf) (bibtex: Brenner-1993-CSD). Brain Cabral and Leith Leedom. Imaging Vector Fields Using Line Integral Convolution. In Proceedings of SIGGRAPH, pages 263-270. ACM Press, 1993. (pdf) (bibtex: Cabral-1993-LIC). Jon Christensen, Joe Marks, and Stuart Shieber. Placing Text Labels on Maps and Diagrams, chapter 1. Academic Press, 1993. (pdf) (bibtex: Christensen-1993-PTL). Carolina Cruz-Neira, Daniel J. Sandin, and Thomas A. DeFanti. Surround-screen Projection-based Virtual Reality: The Design and Implementation of the CAVE. In Proceedings of ACM SIGGRAPH, volume 27, pages 135--142. ACM, August 1993. (pdf) (bibtex: Cruz-1993-SSP). M. H. Dickinson and K.G. Gotz. nsteady Aerodynamic Performance of Model Wings at Low Reynolds-Numbers. Journal of Experimental Biology, 174:45-64, 1993. (bibtex: Dickinson-1993-UAP). D.A. Keim and H.P. Kriegel. Possibilities and Limits in Visualizing Large Amounts of Multidimensional Data. In Proceedings of International Workshop on Perceptual Issues in Visualization, 1993. (pdf) (bibtex: Keim-1993-PLV). Joseph Marks and Stuart Shieber. The Computational Complexity of Cartographic Label Placement. Technical Report TR-05-91, Center for Research in Computing Technology, Harvard University, 1993. (pdf) (bibtex: Marks-1993-CCC). Steve Bryson and Creon Levit. The Virtual Wind Tunnel. IEEE Computer Graphics and Applications, 12(4):25-34, July/August 1992. (pdf) (bibtex: Bryson-1992-TVW). Kristina D. Miceli. A Framework for the Design of Effective Graphics for Scientific Visualization. Technical Report RNR-92-035, NASA Ames Research Center, December 1992. (pdf) (bibtex: Miceli-1992-FDE). G.R. Spedding. 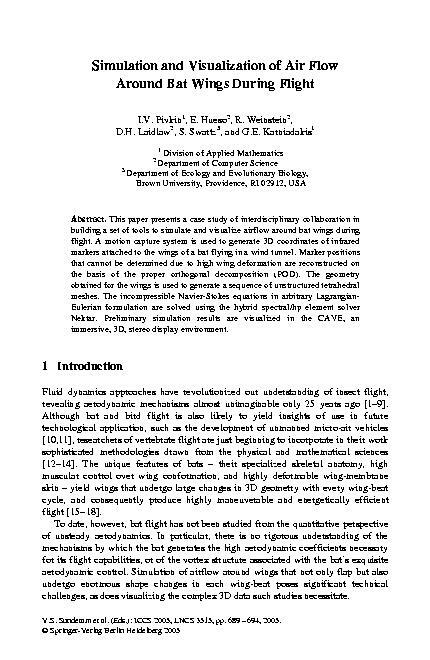 The aerodynamics of flight, volume 11 of Advances in Comparative and Environmental Physiology. Springer-Verlag, Berlin, 1992. (bibtex: Spedding-1992-AFL). Rebecca R. Springmeyer, Meera R. Blattner, and Nelson L. Max. A Characterization of the Scientific Data Analysis Process. In Proceedings of the Second IEEE Visualization Conference, pages 235-242, October 1992. (pdf) (bibtex: Springmeyer-1992-ACO). Charles Wallschlaeger and Cynthia Busic-Snyder. Basic Visual Concepts and Principles for Artists, Architects and Designers. McGraw Hill, 1992. (pdf) (bibtex: Wallschlaeger-1992-BVC). Ronald J. Brachman, Deborah L. McGuinness, Peter F. Patel-Schmeider, Lori A. Resnick, and Alexander Borgida. Living with CLASSIC: When and How to Use a KL-ONE-Like Language. In Principles of Semantic Networks: Explorations in the Representation of Knowledge, pages 401-456. Morgan Kaufmann Publishers, San Mateo, CA, 1991. (pdf) (bibtex: Brachman-1991-LWC). Stephen M. Casner. A Task-Analytic Approach to the Automated Design of Graphic Presentations. ACM Transactions on Graphics, 10(2):111-151, April 1991. (pdf) (bibtex: Casner-1991-TAA). C.P. Ellington. Limitations on Animal Flight Performance. Journal of Experimental Biology, 160:71-91, 1991. (bibtex: Ellington-1991-LAF). Philip K. Robertson. A Methodology for Choosing Data Representations. IEEE Computer Graphics and Applications, 11(3):56-67, May/June 1991. (pdf) (bibtex: Robertson-1991-MCD). Karl Sims. Artificial Evolution for Computer Graphics. In Proceedings of SIGGRAPH, pages 319-328. ACM Press, July 1991. (pdf) (bibtex: Sims-1991-AEF). Jarke J. van Wijk. Spot Noise texture Synthesis for Data Visualization. In Proceedings of ACM SIGGRAPH 1991, pages 309-318. ACM Press, 1991. (pdf) (bibtex: vanWijk-1991-SNT). A. A. Biewener. Biomechanics of mammalian terrestrial locomotion. Science, 250:1097-1103, 1990. (bibtex: Biewener-1990-BMT). U.M. Norberg. Vertebrate flight: mechanics, physiology, morphology, ecology and evolution. Springer-Verlag, Berlin, 1990. (bibtex: Norberg-1990-VFM). Shuhua Shen, Georges Grinstein, and Stuart Smith. Exvis: the exploratory visualization tool (abstract). In Proceedings of ACM Annual Conference on Cooperation. ACM Press, 1990. (pdf) (bibtex: Shen-1990-EEV). Edward Tufte. Envisioning Information. Graphics Press, 1990. (bibtex: Tufte-1990-EIN). Vibeke Sorensen. The Contribution of the Artist to Scientific Visualization. Technical report, School of Film and Video, California Institute of the Arts, 1989. (pdf) (bibtex: Sorensen-1989-CAS). Ronen Barzel and Alan H. Barr. A Modeling System Based on Dynamic Constraints. Computer Graphics, 22(4):179-188, August 1988. (pdf) (bibtex: Barzel-1988-MSB). Donna J. Cox. Using the Supercomputer to Visualize Higher Dimensions: An Artist's Contribution to Scientific Visualization. Leonardo, 21(3):233-242, 1988. (pdf) (bibtex: Cox-1988-USV). Andrew Witkin and Michael Kass. Spacetime Constraints. Computer Graphics, 22(4):159-168, August 1988. (pdf) (bibtex: Witkin-1988-SCO). Irving Bierderman. Recognition-by-Components: A Theory of Human Image Understanding. Psychological Review, 94(2):115-147, 1987. (pdf) (bibtex: Biederman-1987-RBC). U. M. Norberg. Wing form and flight mode in bats. In Recent advances in the study of bats, pages 43-56. Cambridge University Press, 1987. (bibtex: Norberg-1987-WFF). U. M. Norberg and J. M. V. Rayner. Ecological Morphology and Flight in Bats. Wing Adaptations, Flight Performance, Foraging Strategy and Echolocation. Philosophical Transactions of the Royal Society of London Series B-Biological Sciences, 316:337-419, 1987. (pdf) (bibtex: Norberg-1987-EMF). G.R. Spedding. The wake of a kestrel (Falco tinnunculus) in flapping flight. J. exp. Biol., 127:59-78, 1987. (bibtex: Spedding-1987-WKF). Andrew Witkin, Kurt Fleischer, and Alan H. Barr. Energy Constraints on Parametrized Models. Computer Graphics, 21(4), July 1987. (pdf) (bibtex: Witkin-1987-ECP). Guyton A.C. Textbook of Medical Physiology. W.B. Saunder Company, 1986. (bibtex: Guyton-1986-TMP). Jock Mackinlay. Automating the Design of Graphical Presentations of Relational Information. ACM Transactions on Graphics, 5(2):110-141, April 1986. (pdf) (bibtex: Mackinlay-1986-ADG). G. R. Spedding. The wake of a jackdaw (Corvus monedula) in slow flight. J. exp. Biol., 125:287-307, 1986. (bibtex: Spedding-1986-WJC). Joan Gay Snodgrass, Gail Levy-Berger, and Martin Haydon. Human Experimental Psychology. Oxford University Press, 1985. (bibtex: Snodgrass-1985-HEP). William S. Cleveland and Robert McGill. Graphical Perception: Theory, Experimentation, and Application to the Development of Graphical Methods. Journal of the American Statistical Association, 79(387):531-554, September 1984. (pdf) (bibtex: Cleveland-1984-GPT). C.P. Ellington. The aerodynamics of hovering insect flight. IV. Aerodynamic mechanisms. Phil. Trans. Roy. Soc. Lond. B, 305(1122):1-15, 1984. (bibtex: Ellington-1984-AHI). R. Beach and M. Stone. Graphical Style. Towards High Quality Illustrations. In Proceedings of SIGGRAPH, volume 17, pages 127-135. ACM Press, 1983. (pdf) (bibtex: Beach-1983-GST). J. Bertin. Semiology of Graphics. University of Wisconsin Press, 1983. (bibtex: Bertin-1983-SOG). Edward Tufte. The Visual Display of Quantitative Information. Graphics Press, 1983. (bibtex: Tufte-1983-VDQ). Mark Friedell, Jane Barnett, and David Kramlich. Context-sensitive Graphics Presentation of Information. Computer Graphics, 16(3):181-188, July 1982. (pdf) (bibtex: Friedell-1982-CSG). G. A. Cavagna. Force platforms as ergometers. J. Appl. Physiol., 39:174-179, 1975. (bibtex: Cavagna-1975-FPE). Peter S. Stevens. Patterns in Nature. Little Brown and Co, 1974. (pdf) (bibtex: Stevens-1974-PNA). S. Vogel. Flight in Drosophila. II. Variations in stroke parameters and wing contour. J. Exp. Biol., 46:383-392, 1967. (bibtex: Vogel-1967-FDV).